When a person is agile, he or she is able to move quickly and easily with lithe, well-coordinated movements. Wouldn’t you love to be able to characterize your organization the same way? Well, when you successfully implement Agile and Lean methodologies, you can. Imagine eliminating cumbersome processes, red tape and wasteful steps. Imagine speeding your products to market way ahead of your competitors. Imagine easily completing critical tasks and reaching goals without the usual delays, frustration and overwhelm. With Agile/Lean methods, this is all completely possible… we’ll show you how in this presentation. You’ve heard of Agile, but don’t think it can be applied to your business. This is a common misconception. Agile/Lean methodologies can actually be applied to any business to create massive improvements in processes and outcomes. Let us show you how. You are intrigued by Agile, but have no idea where to begin. The basic concepts and methodologies of Agile may seem far too simple and esoteric to replace whatever complex process you are using now. But, although Agile is just 4 values and 12 principles, it can and will completely transform your business. During this luncheon, we’ll show you exactly where to begin. In fact, we’ll be sharing proven techniques you can implement in your organization that very same day. You would love to get a “leg up” on your competition. Tired of being trumped by the competition? We explain how and why applying Agile methodologies will help you break away from the pack and rise to the top of your market. You want to avoid costly pitfalls that would prevent you from reaching your goals. We will discuss why some organizations struggle with their Agile implementations, and how you can avoid their costly mistakes so all your goals are reached. You’d love to talk to an Agile Coach in person and meet other Agile enthusiasts. This presentation is being delivered by one of the most sought-after Agile coaches in the industry – Dimitri Ponomareff with Torak Agile Coaching. He has coached many well-known organizations to success including Best Western International, American Express, Charles Schwab and many, many more. He will be happy to answer your Agile questions along with his team of top Agile coaches. This is your chance to get your most burning Agile questions answered. 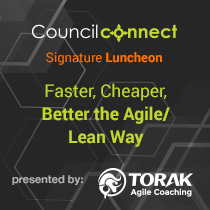 Still not 100% convinced you should come enjoy a fantastic lunch at one of Phoenix’ top-rated restaurants while learning how Agile can transform your entire organization? Well, here’s one last thought: after the event, we will send every luncheon attendee a link to our entire, information-packed presentation. You will be shocked at the amount of valuable information contained in these slides. And a side bonus is you’ll get to enjoy your delicious food at The Gladly without having to stop and take notes. We have always believed in openly sharing our Agile expertise, in fact, here’s a link to several of our past presentations. Once you take a look at these presentation decks you’ll see why we are consistently ranked in the top 5% most-viewed on SlideShare. There you have it, a plethora of reasons to attend this valuable Agile presentation on June 15th. We look forward to showing you how Agile can help get you to market faster, increase quality across the board and delight your customers.